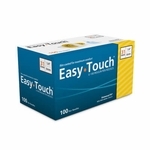 Easy Touch Insulin Syringes Are Film Coated For Maximum Comfort. Generally speaking, you should size your syringe to your maximum injection dosage. For example, if you are taking 20 units per shot, you could use either a 0.5cc/50 unit syringe or a 0.3cc/30 unit syringe. If you are taking 60 units, use a 1cc/100 unit syringe. Since the markings are wider apart the smaller the syringe size, it is generally easier to read a 35 unit dosage on a 0.5cc/50 unit syringe than on a 1cc/100 unit syringe. It is easier to read a 15 unit dosage on a 0.3cc/30 unit syringe than on a 0.5cc/50 unit syringe. There is nothing wrong with doing a 15 unit dosage on a 1cc/100 unit syringe, but remember, being precise with your dosage leads to better diabetes management. 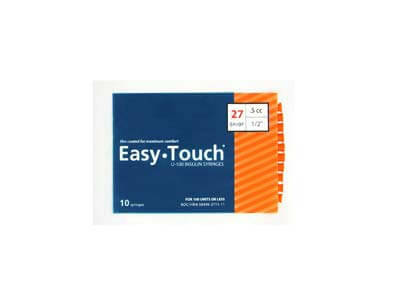 Easy Touch needles are available with 28 gauge, 29 gauge, 30 gauge and 31 gauge, sizes. This number represents the U.S. standard sizing for stainless steel hypodermic tubing. The actual dimensions are: The larger the gauge size, the smaller the outside diameter, and therefore, the smaller the hole put in you. You and your physician or diabetes educator must be the judge of your comfort level and needs. Optimum design provides comfortable and positive grip for each control. Please note, that the standard length of the 27 gauge, 28 gauge, and 29 gauge needles are 1/2�, while the 30 gauge comes in both 1/2� and 5/16�, and 31 gauge are only 5/16� in length. This shorter needle helps to prevent the much thinner needle from bending. There is also a psychological incentive to use a shorter needle, but most adults will find that the 1/2� length will work just fine, as they need a slightly larger diameter and greater length.